Go to Financial Aid > Settings. 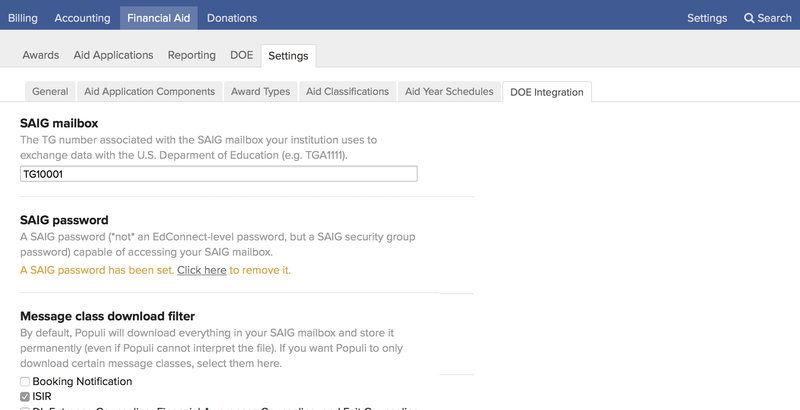 SAIG Mailbox: Enter your school's SAIG mailbox's TG number (e.g. TGA1111). SAIG Password: Enter the Group Properties password for your school's SAIG mailbox. Remember that SAIG requires you to reset this password every 90 days. Every time you reset it, you will need to come back here and enter the new password. You can use this site to reset your password. Message Class Download Filter: Check ISIR; leave all the other boxes unchecked. This will ensure that only ISIRs are fetched by the message filter—anything you leave unchecked will not be imported into Populi. Once those settings are entered, scroll to the top of the screen and click Save. In Financial Aid > DOE > SAIG Log. Click View ISIRs to begin processing the file batches. In Financial Aid > Aid Applications > ISIRs. This report shows you all the ISIR batches you have—whether you uploaded them manually or received them via SAIG. Once you've found the batch files, you can begin processing them.